Homecoming Week is finally here! Show your Maverick pride at any one of a number of events planned this week, from the chili cook-off to alumni gatherings and from honoring veterans to the excitement of our top-rated men’s and women’s basketball teams in action! Maverick Homecoming continues through Sunday, Nov. 12. Visit Homecoming 2017 for details and ticket information. Volunteer to work behind the scenes and ensure Maverick spirit is at an all-time high. Lend a hand for the parade, chili cook-off, The BASH, and more. Volunteers will receive a long-sleeve commemorative Homecoming T-shirt. Register to volunteer. LEARN MORE. 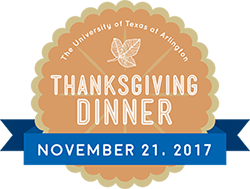 A new Maverick tradition, UTA's Thanksgiving dinner is a chance to share fellowship and gratitude. The meal is 5-8 p.m. Tuesday, Nov 21, in the Connection Café in the University Center. The meal is free for students with a meal plan. Tickets are required for others: $5 for students and $8 for faculty, staff, and friends. Receive a free meal by volunteering. LEARN MORE.